Men face a common yet aggravating nighttime ritual as they get older. But the annoyance of frequent urination in the middle of the night poses another problem. The cumulative effects from disrupted slumber due to age and nighttime urination issues may lead to sleep deprivation, sluggishness and decreased focus. A good night's sleep is in the sack when your prostate is in top working order. That's because breakthrough research suggests that prostate health and the frequency of night time urination may improve with antioxidant supplements and a healthy lifestyle. 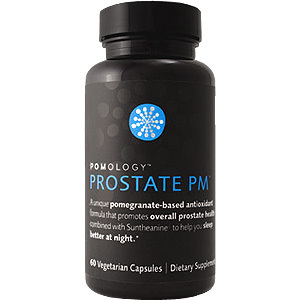 Pomology Prostate PM features a 600 mg dose per serving of a plant phytosterol found to help support health prostate function. Feel the benefits of beta sitosterol, the active ingredient in saw palmetto, as it can help provide relief from urinary symptoms and may minimize nighttime urges. This potent formula promotes healthy prostate size now for healthy function tomorrow. A true advancement in prostate health, Pomology Prostate PM is unique because it optimizes the power of pomegranates, green tea and cranberry antioxidant extracts with the exclusive and patented natural sleep aid, Suntheanine®, to help you sleep through the night. Research indicates the amino acids in Suntheanine® may reduce restlessness and relieve occasional sleeplessness. Pomology Prostate PM is the only prostate supplement to feature this ingredient. Green Tea: Green tea study hints that phytochemicals in the substance may help limit the spread of cancer-causing cells. Prostate PM - 60 caps., (Pomology) is shipped in a discrete, unmarked package. Orders are processed immediately and usually takes about 3 to 5 working days to be received. We do ask that you try it for 2 to 3 weeks to feel the full effects. Any information received is used only for order processing and shipping purposes. Your information, such as e-mail address, will never be disclosed to a third party.